In the annual traverse across the calendar, a certain weekend in August always marks the beginning of my favorite time of the year. That yearly benchmark – the mid-August arrival of the annual Texas Trophy Hunter Association's Hunter Extravaganza show in Fort Worth – is an annual oasis at the end of another hot summer, a kickoff party of sorts for those of us who live for getting afield each autumn to chase deer in Texas. Perhaps nowhere else in the state is the passion that Texans have for their deer hunting pursuits on fuller display than the crowded aisles of the Will Rogers Center where tens of thousands of North Texans will congregate this weekend. From taxidermy mounts of the biggest bucks taken last season to vendor booths filled with the latest in hunting gear and equipment to appearances by hunting personalities like Outdoor Channel's Theresa Vail, the annual TTHA Hunters Extravaganza is a veritable smorgasbord for all that there is to love about Texas deer hunting. Reading - for the umpteenth millionth time - some of the classics of the state's outdoor literature that pertain to hunting deer. Favored dog-eared works and stories that include: Rick Bass' The Deer Pasture; the late John Wooters' Hunting Trophy Deer; the late Hart Stilwell's Hunting & Fishing Texas; Ray Sasser's View from a Tower Blind; the late Bob Brister's Field & Stream magazine classic El Ten; Joe Doggett's Outdoor Chronicles; and Jim Hamm's Ishi & Elvis. All - in my study at least - have helped to make the interminable amount of time from one deer season to the next a little bit more bearable. It's a remote deer camp at the end of a bumpy, dusty and dirt-choked road. Dallas Morning News outdoor writer Ray Sasser once wrote that the best deer camps in the state were at the end of such remote lanes. After more than two decades chasing these critters, I’ve come to the conclusion that he’s absolutely right. The absence of light pollution in the Big Bend country as the presence of uncountable stars silently blaze overhead in the Milky Way Galaxy. It’s some of God’s most glorious handiwork at its very best. The smell of wood smoke, either from a crackling campfire on a cold night or from sizzling rib eyes grilling to medium-rare perfection over the glowing coals of a mesquite wood fire. Campfire tales of legendary bucks, the regret of a missed opportunity, fond recollections about a favorite bow hunt or even a passionate debate centered on what the best deer hunting rifle caliber and bullet combination might be. Hurriedly climbing up the stairs of a tower blind as the sky begins to blush pink on the eastern horizon and the corn feeder threatens to noisily go off. Sitting in a treestand high up in a red oak tree as autumn acorns rain down to the ground and sound the dinner bell for hungry whitetails. Not to mention the angry fox squirrel scolding you for intruding upon his private chow hall. Chocolate colored horns in the southern counties and lightly hued tan antlers up north. Wind driven snow and 32 degrees in the state’s Panhandle and a sultry 90 degree afternoon down in Laredo on the very same December day. Stopping by the Los Cazadores’ deer contest headquarters in Pearsall to enter the world’s biggest deer contest and to check out the latest leaderboard update and monster buck photographs. Winning a highly prized Los Cazadores awards jacket for a big buck that you have entered into the contest. Spotting various outdoors television celebrities and their film crews at a local mom-and-pop café as they come to town to film an Outdoor Channel TV show. Possessing an invite to the best deer camp in Texas, the legendary and vast King Ranch where dozens and dozens of low-fenced Boone & Crockett caliber bucks roam the coastal plains and brush country near Kingsville. Tripods and tower blinds in the South Texas brush country, elevated plywood box blinds in the state’s central Hill Country, ladder stands in the Red River Valley of North Texas and climbing treestands in the eastern Pineywoods region. Aggressive horn rattling on a crisp December day in the South Texas brush country as you try to pick a fight with a testosterone crazed Muy Grande sized whitetail buck looking for love. Summer evenings spent flinging broadheads at a 3-D deer target or an early fall Saturday afternoon spent at the gun range sighting in your .270, with the help of a Lead Sled. The latter with the weekend’s University of Texas Longhorns’ football game blaring on the radio, of course. A frosty November dawn as a grunting buck puts his nose down to the light colored caliche filled ground as he trails an estrous doe like a bird dog with a big snootful of bobwhite quail. Deer camp grub: ten-alarm chili, sizzling steaks and venison backstrap, traditional scrambled egg migas, buttermilk pancakes, ranch-style beans and a few Vienna sausages washed down by water, camp coffee, or your favorite cold beverage. The “Golden Triangle” region of the South Texas brush country, some of the world’s best whitetail hunting spots in places like Dimmit, LaSalle, Maverick, Webb and Zavala counties. Picking prickly pear cactus spines out of your tender backside because you didn’t pay close enough attention to where you were sitting down to rest for a spell. The busy Friday night before the season starts – honestly, it feels a bit like Christmas Eve – in small deer-rich Texas communities like Lufkin, Quanah, Strawn, Throckmorton, Llano, Mason, Fredericksburg, Pearsall, Cotulla, Encinal, Laredo and Eagle Pass to name a few. Listening to the radio broadcast of a Friday Night Light’s high school football playoff game from one of those Texas deer hunting towns as you sit around the campfire. “Corning” a sendero the next morning with a sack full of the little gold nuggets before you climb into a pre-dawn stand. Watching early morning rush-hour whitetail traffic develop around a congested feeder as it spins out a pile of kernels onto the ground in Hill Country counties to the west of Austin and northwest of San Antonio. A nervous deer camp scoring session to see if a hard-won buck is a Boone & Crockett Club, Pope & Young Club or Texas Big Game Awards program contender. Or if the dreaded scourge of ground shrinkage, a common ailment in many a Texas deer camp, is on the loose again. An excited crowd gathering around the back of a pick-up truck at the local venison processing plant where a grinning hunter begins to tell his big buck tale while a collection of smart-phones begins to record it all for posterity’s sake. Walking into a local convenience store to buy ice - and a few snacks - for the spacious Yeti Cooler. While wearing the official Texas fall hunting camp uniform, a camo outfit comprised of either Realtree’s Max-1 XT pattern, Mossy Oak’s Brush offering or the locally inspired Brush Country or Bushlan camo duds. A bundled-up pre-dawn ride to a stand location aboard a four-wheeler. Or better yet, a hike that builds up some sweat equity, moisture that will soon have a hunter’s teeth chattering as he or she climbs into a stand and sits down in the chilly pre-dawn gloom. Squirrels barking, Rio Grande turkeys gobbling, sandhill cranes and their mysterious melody, snow geese with their high-pitched honks, bobwhite quail whistling on a hillside and mourning doves whipping about, all as you guard a woodsy bottleneck filled with deer traffic. Legendary stand locations with both big antlered histories and a good name told by a great story. Stand names on a camp map like the I-35 blind, Amen Corner, the San Antone Hilton, the Judge’s Bench, Convict Station and Never Fail. 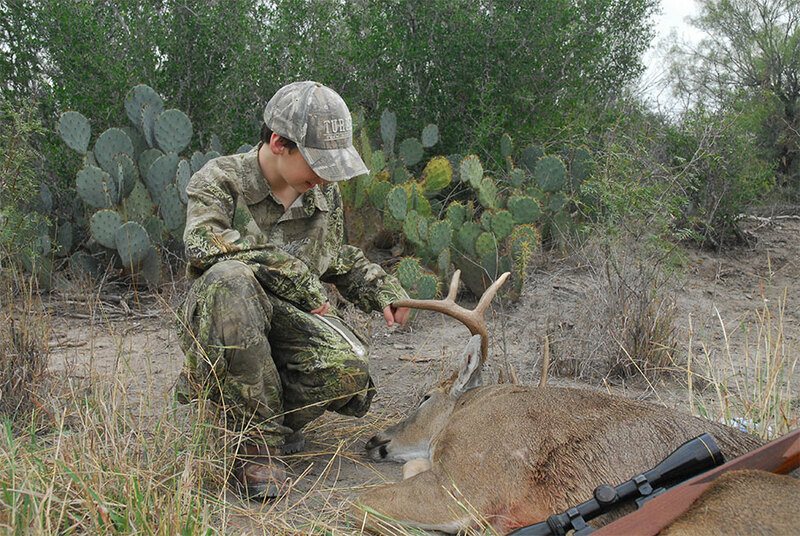 The Texas-wide smile of a youngster after they have tagged their very first buck. And soon, fresh venison backstrap from that buck sizzling on the grill or being chicken-fried in an iron skillet. Watching one Texas deer season begin, another one end and all the while counting down the days until you can do it all over again. So there you have it, a collection of the sights, sounds and ideas that make Texas deer hunting so grand each year. Because at the end of another Lone Star State day, there’s so very much to like about deer hunting, especially the deer hunting found deep in the heart of Texas.